We’re giving away run of engagement tickets to see Elaine Stritch: Shoot Me when it opens in select theaters on March 7th. To enter, e-mail us at contests@cinedelphia.com with your full name and address. Winners will be chosen at random, only one entry per household please! Now in her late 80s, Broadway legend Elaine Stritch remains as ferociously funny as ever. In this bold, hilarious and poignant portrait, the uncompromising Tony and Emmy Award-winner is revealed both on and off stage. Candid reflections about her life are punctuated with words from friends (including James Gandolfini, Tina Fey, John Turturro, Hal Prince, George C. Wolfe, Nathan Lane and Cherry Jones) and archival footage that showcases some of the great moments from her career. Whether dominating the stage, tormenting Alec Baldwin on the set of 30 Rock, or sharing her struggles with aging, diabetes and alcoholism, Elaine Stritch: Shoot Me reaches beyond the icon’s brassy exterior and reveals an inspiring portrait of a complex woman and artist. 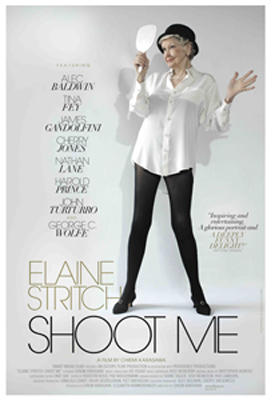 Elaine Stritch: Shoot Me opens Friday, March 7th, at the Ritz Bourse.